Posted on Tue, Jan 12, 2010 : 3:02 p.m.
Making the decision to combine nonprofit business advocacy groups in Ann Arbor and Ypsilanti may have been the hardest part of the merger announced in late December. That’s because the possibility of uniting the chambers of commerce had been discussed for decades, only to stall at the “invisible” wall at US-23 that divides the two communities. 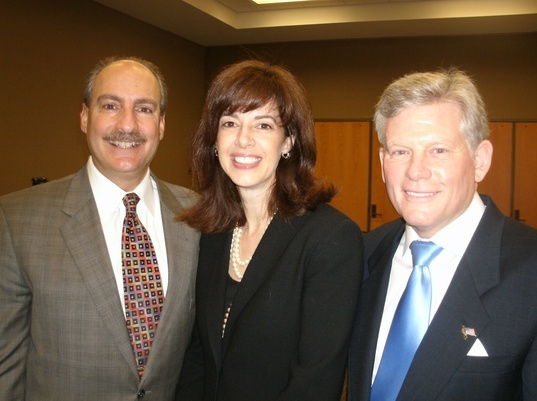 Karl Couyoumjian, Diane Keller and Mark Ouimet gather Tuesday morning after the Ann Arbor/Ypsilanti Regional Chamber of Commerce's first official event since announcing the merger of the two local chambers. Now only the details of how the new Ann Arbor/Ypsilanti Regional Chamber of Commerce will operate need to be worked out, the group’s leadership told a crowd of more than 300 gathered Tuesday morning at the first joint meeting of the new entity. “I truly believe the most difficult part of our work is behind us,” said Karl Couyoumjian, board chair. Yet plenty of work remains, the crowd was told. Legal issues involving merging two nonprofit boards are on that list. So are aligning staffs, membership rate structure and budget cycles - and even determining the optimal office configuration since both groups come to the merger with their own respective operations. Members of both groups who attended the breakfast to learn details of the merger left with assurances they’d get the information as soon as it becomes available. In the meantime, Diane Keller, president of the regional chamber as of Jan. 1, told members of both chambers they could take advantage of all scheduled events on each group’s calendar. “You can now go back and forth to both chambers for same member price,” she said. Members at the breakfast crowded into the meeting space at Washtenaw Community College’s Morris Lawrence Building, forcing staff to add more tables in the moments before the program began. Audience members didn't get a chance to speak - but the speakers, including Ann Arbor SPARK CEO Mike Finney, drew applause as they discussed what a unified chamber means to both members and the community. The chamber move, many said, would not only benefit members. It also could inspire the community to think more regionally and collaboratively. The merger will let both groups operate more economically, officials said. According to each group's most recent filings with the IRS, the Ypsilanti chamber had total revenue of $277,513, with $157,083 coming from membership fees. The Ann Arbor chamber had revenue of $1.078 million, with $557,516 coming from membership and $449,321 from program revenue. Ypsilanti's data was from the fiscal year ending May 31, 2008, while Ann Arbor's data was from the fiscal year ending Dec. 31, 2007. The decisions to be made include staffing, Couyoumjian said. It will be up to Keller to align the staff to the need of the larger group, which will represent about 1,250 members from Ann Arbor and 450 from Ypsilanti - and about 200 who belong to both. The boards for each group face changes, too. A joint executive board will oversee the individual boards until the official merger is completed, likely by May. That board will be half from the Ann Arbor group and half from the Ypsilanti group. Moving forward, one board of 24 members and an executive committee of 10 members will direct the combined group. The makeup will be 50-50 between the two communities. Couyoumjian said the 50-50 split “was a way to move this forward” without the smaller Ypsilanti group feeling like it was moving into a situation where the members would not be equal participants in the merged entity. Meanwhile, member input will be sought on office configuration and location, Keller said. The Ann Arbor group had put its downtown office up for sublease, while the Ypsilanti office already has sublet some space to tenants. The changes facing the chambers will make the unified group stronger, officials said. Advocacy will continue on a higher level with more partners sought, along with a larger statewide profile to mirror the role the Ann Arbor region plays in the state’s economy. “We hope to be a model of prosperity in our community,” Keller said. Members will be able to network in a wider audience and find broader connections within their new, larger chamber, Petz said. Tue, Jan 12, 2010 : 3:26 p.m. I hope and pray this is the beginning of a real sense of togetherness between the two municipalities.